Mr MWCED has been asking me for ages when I am going to use up the frozen raspberries in the freezer. Hmmm, I didn’t really have an answer – we still have PLENTY of berry vinegar so that wasn’t an option. Go to Google. Of course! Muffins. The lemon cuts the raspberry and sugar, and the cinnamon adds a delightful extra. These are Very Good. Be careful when mixing the muffin mix, you want the raspberries to stay as whole as possible. That way you get lip smacking whole goodness raspberry taste as you bite in. Yummmm. There were quite a few recipes on Google, I cut and pasted from a couple of them. Hope you approve of the mix. Enjoy. In a bowl, combine sugar, oats, cinnamon and lemon juice; set aside. If you want a finer topping then quickly whizz these ingredients in the food processor (I did not do that, but think I will when making this again). In the food processor, whisk together sugar with lemon zest. I couldnt find our zester so had to finely chop before putting into the food processor. You just want the lemon zest pieces to be very tiny. Ok, I admit it, I am a very lazy cook! Spoon into prepared muffin pan, smoothing tops; sprinkle evenly with topping. Bake for 25 to 30 min or until tops are firm to the touch. I found my mixture was quite sloppy so baked them for a wee bit longer, probably about 40-45 minutes – just watch the topping……..
Let cool in pan for 10 min. Transfer to rack to cool. And then spread with cream cheese for a truly sinful morning or afternoon delight. 1 banana shallot – ok I don’t expect you will always have a banana shallot on hand. For some wonderful reason they seem to be in season and readily available here, and l am loving them. Sub with plain onion, chives, spring onion, you get the drift…. 1 egg – great! 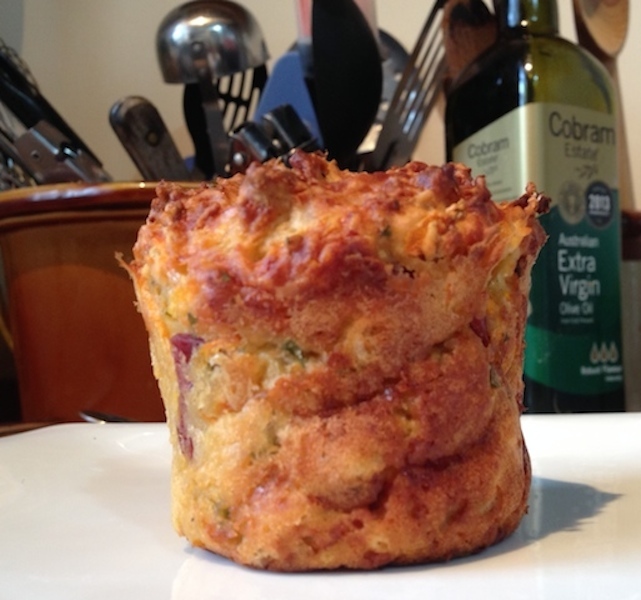 A muffin recipe that doesn’t demand that you have a big stock of eggs on hand. 1/4 cup mango chutney – now I had mango chutney in the cupboard so that’s what i used, but I can see a myriad of opportunity here to experiment! Preheat oven to 200 deg C. Grease a 6 cup Texas muffin pan, or just get out your 6 cup silicone pan – it doesn’t need greasing, but best at this stage to put in on the oven tray. Sift flour (and baking powder if using plain flour) into a large bowl. Add cheese, diced salami, grated carrot and diced shallot. Grind lots of pepper over and some salt. Up to you how much salt you use, I don’t use a lot maybe just a few grinds. Mix lightly with a fork (not too much – just so they are mixed together). Whisk milk, egg and mango chutney in another bowl until well combined. Pour the milk mixture into the dry ingredients – mix lightly, just until there is no more dry mixture left. Overmixed muffin mixture will make your muffins tough. Spoon into the muffin pan. (You could make smaller muffins, i.e. use a 12 pan). Bake for up to 20 minutes, until a skewer inserted in the middle comes out clean. They might take a little shorter, or even a little longer. Don’t worry. Just wait patiently until (a) the skewer trick works and (b) you can smell the delicious aroma of the muffins throughout the house. Keep in pan for a few minutes before turning out onto a rack to cool. Easy! And Mr MWCED had 2! A wonderful accompaniment is always a cup of tea. Tried a new tea today, and am in love. 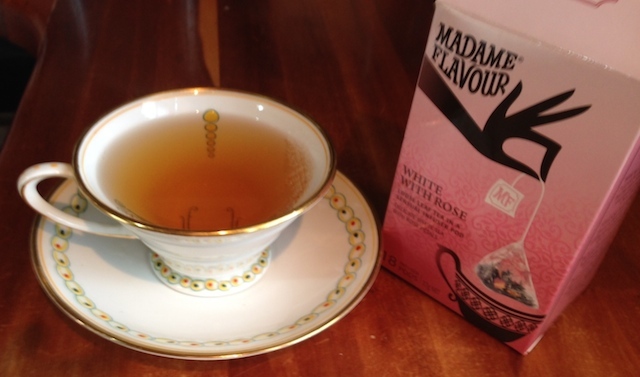 It is a Madame Flavour tea, White with Rose. A delicate taste, with a hint of rose aftertaste. Now onto my 2nd pot and likely another later this afternoon. Well, ok, maybe that is overload, but irrestible. Am also in love with my teacup. A friend gave me two of these a few years ago for a birthday present, and until the other week they were sadly sitting in the cabinet. Not now. It makes my tea all the more enjoyable to use a beautiful cup and saucer.